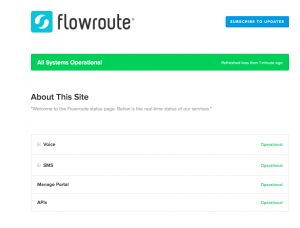 Flowroute launches new network status page! Today we are happy to announce the launch of our new status page which is intended to help our customers track the status of Flowroute’s calling and messaging services. System Status – Allows you to confirm the availability of Flowroute’s inbound/outbound voice, SMS, and APIs. Outages and Incidents – Helps keep track of major network events that may potentially impact your services. Patching and Maintenance – Provides information about Flowroute’s maintenance cycles and upgrades. We encourage all of you to visit the Status Page for more information and subscribe to status notifications via email, SMS, RSS, and Webhooks. From its inception, Flowroute has always been laser focused on the needs of our customers. We are committed to being proactive and transparent across social, email, and Intercom (in-app messaging). As we’ve grown, it became apparent we needed to provide one consistent location that our customers could receive real-time updates about the health of our network and services. The long overdue status page reflects our primary goal of being customer-centric and ensuring you always know as much as we do when it comes to your Flowroute services. Moving forward, the new Status Page will act as the centralized place for all service updates. It will not only ensure prompt customer communication but also enable quicker incident resolution by allowing our operations teams to be more efficient. You will still be able to receive updates through twitter on @FlowrouteNoc and @Flowroute, as well as through Intercom. We do however recommend you subscribe to the new status page for the most up-to-date information on our network and services.